Green Chef is a highly successful Colorado-based meal kit company launched in 2014. It was founded by a team of experts and food enthusiasts passionate about coming up with creative recipes for delicious, healthy meals that can satisfy nearly any taste and appetite. It offers an astonishing variety of meal programs for different diets, which is one of the main reasons for its growing popularity. This meal kit delivery service allows you to eat clean, cook easily, and diversify your diet while taking perfect care of your health and saving time on meal planning and grocery shopping. 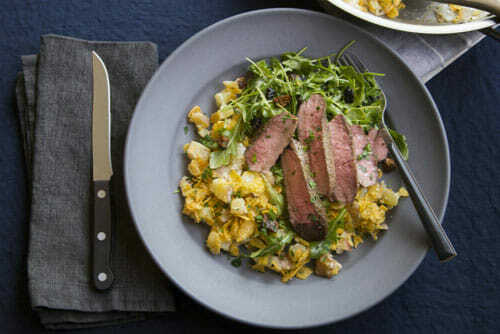 Keep reading this Green Chef review and discover more reasons to give this excellent meal kit delivery a try. Green Chef is a meal kit service that delivers certified organic and gluten-free ingredients and recipes for 8 most common diets, ranging from vegan to carnivorous. It provides weekly home delivery and lets you cook your dinners in about 30 minutes. 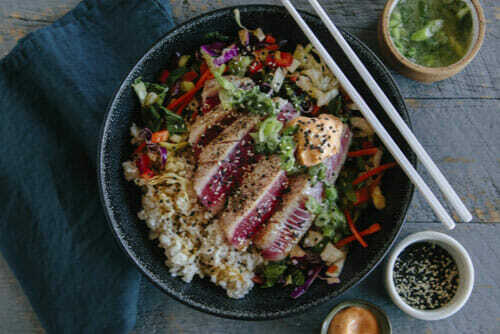 It is one of the best organic meal kit delivery services in existence and it was the first American service of its kind to receive organic certification. Thus, if you want the freshest, completely natural food on your table, Green Chef might just be the ideal choice for you. In order to deliver only the finest food to your doorstep, this service cooperates with trusted farmers, ranchers, fishermen, and artisans and settles for nothing but pure natural perfection. The produce it provides is handpicked, the meat is of the best quality, and the spices are touched by nothing but nature. Although a great solution for virtually anyone who wants to eat healthily with less effort, it is one of the best solutions for individuals with one or multiple dietary restrictions. There is hardly any meal kit service that offers so many options for special diets. Green Chef does not only provide allergy-friendly recipes and meal kits free from animal products but also covers some of the most popular low-carb diets including keto. It is also important to note that its recipes are quick and easy to follow, its subscriptions are easily modifiable, and its menus are constantly expanding. When becoming a Green Chef customer, you get to decide whether you want to cook for 2 or 4 people. If you are cooking for 2, you can choose from 7 meal programs for different diets. The 4-person option lets you pick 1 out of 2 kid-friendly programs. The service provides a separate weekly menu for each program. With 2-person programs, you can pick 3 out of 4-6 recipes on the weekly menu while 4-person programs bring you 2 recipes handpicked by the Green Chef culinary team. Weekly shipments are delivered in insulated, refrigerated boxes so the ingredients would remain fresh even if you are not home when your order arrives. All ingredients are pre-portioned, which means you can contribute to reducing food waste. Alongside the produce, meat, and company’s signature sauces, marinades, and spice blends, you receive easy-to-follow recipes created by an experienced chef. The meals can be prepared in 30 minutes or less. Your Green Chef subscription is renewed automatically every week, but you are always free to cancel it. The same goes for making any changes to your subscription. You can skip a week, receive shipments every 2 or 4 weeks or change your meal plan whenever you wish. Green Chef offers numerous options for anyone who is on a special diet or enjoys a particular lifestyle. There are chef-crafted recipes for meat lovers, omnivores, pescatarians, vegans, vegetarians, keto dieters, people on the Paleo diet, and individuals who are allergic to gluten. With Green Chef, you do not have to choose between tasty and healthy food. Every single ingredient it provides is carefully picked, GMO-free, and good for your body. This meal delivery service can save you a lot of time you would otherwise spend on grocery shopping. It can also save you money as organic ingredients are usually very expensive in stores. Another characteristic that makes Green Chef different is that it is are truly a green company. The company invests great efforts into educating people about the seriousness of food waste. Plus, all the boxes and packaging you receive from Green Chef are either recyclable or reusable. Green Chef is uniquely flexible as well. There aren’t many meal delivery services that allow you to change your meal plan whenever you want or arrange the delivery when it suits you the most. Fortunately, Green Chef lets you be the master of your schedule by allowing you to pick your delivery day, delivery week, and even delivery month. You can receive shipments weekly, but you can also opt to get a delivery every 2 or even every 4 weeks. There is hardly any meal kit service that offers so many options for special diets. Green Chef does not only provide allergy-friendly recipes and meal kits free from animal products but also covers some of the most popular low-carb diets including keto. 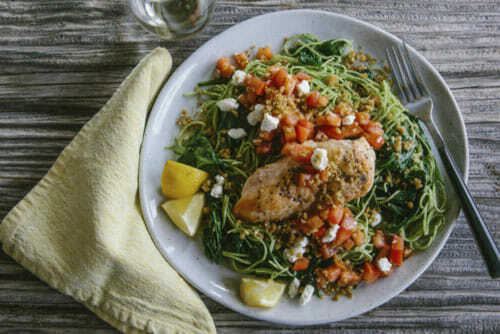 Green Chef offers a phenomenal variety of recipes for a number of diets. The recipes are created by professional chefs and even people with little experience in the kitchen will find it easy to follow Green Chef’s instructions. With simple, detailed recipes and pre-portioned ingredients, you can quickly become a skillful chef yourself. Like we mentioned previously in this Green Chef review, you get to choose between the 2-person and the family plan designed for 4 people. If you opt for any of the 7 different 2-person meal programs, you receive ingredients for 3 meals for 2 people every week. When you choose the family plan, you get ingredients for 2 family-style dinners per week, both of them portioned for a family of 4. Keep in mind that a professional chef pays close attention to the ingredients and nutritive values, so you will receive recipes appropriate for both children and adults. Green Chef offers 7 different programs within the 2-person meal plan: balanced living, pescatarian, gluten-free, plant powered, vegetarian, keto, and Paleo. It is important to note that the gluten-free, keto, and Paleo programs are all certified gluten-free. While all 2-person programs bring you 3 recipes per week, they differ in the number of options available on the dedicated menu. The plant powered (vegan) menu features 4 recipes per week. The pescatarian, gluten-free, vegetarian, keto, and Paleo menus include 5 recipes per week. 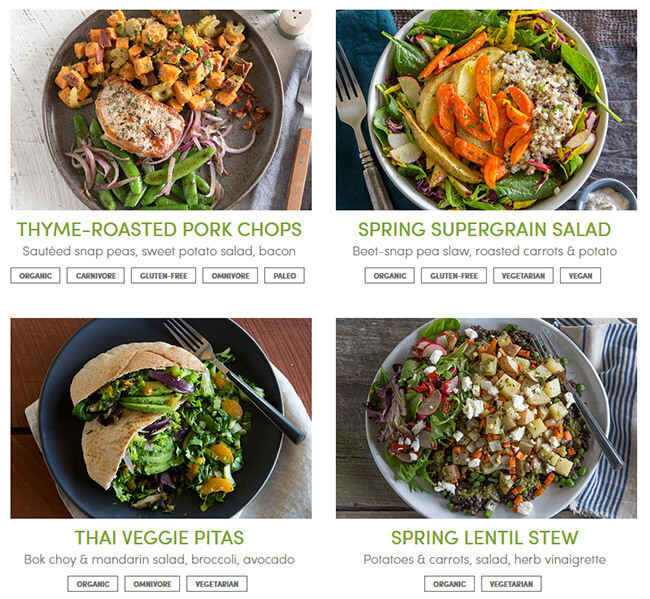 Finally, the balanced living (omnivore) menu lets you choose from 6 recipes every week. The family plans provide a smaller number of choices. You can only choose between the omnivore and the carnivore programs with this meal plan. Both the omnivore and the carnivore menus feature just 2 recipes per week. This means that you cannot choose your meals and you can only skip a delivery in case the current offer does not suit your taste. All Green Chef recipes are easy, beginner-friendly, and rather quick. You never have to spend more than half an hour in the kitchen and the pre-made signature sauces, marinades, and spice blends allow for speedier prep. Not only that, but they elevate the flavor of your meals and allow you to cook restaurant-grade dishes with minimum effort. Before we proceed to the Pricing section of this Green Chef review, there is one minor matter we would like to address. Namely, the service clearly states that the 2-person plan is designed for 2 people and that the family plan is designed to satisfy the needs of families of 4, as we mentioned above. What we found peculiar was the fact that once you decide to order, Green Chef asks you whether you want to cook for 1, 2, 3 or 4 people. The problem is that it indeed only offers 2-serving and 4-serving recipes, no matter which number you choose (1, 2, 3 or 4). This may be confusing to some customers and we believe that the service should make matters clearer and remove the 1-person and 3-person options. All Green Chef recipes are easy, beginner-friendly, and rather quick. You never have to spend more than half an hour in the kitchen and the pre-made signature sauces, marinades, and spice blends allow for speedier prep. Green Chef charges you per portion. Its prices are close to the industry average and range from $9.99 to $12.99 per serving (shipping not included). They depend on 2 main factors – the meal plan you choose and the dietary program you opt for. With the 2-person meal plan, you receive ingredients for 3 dinners for 2 people, which is 6 servings in total. The vegetarian program starts at $9.99 per portion. For balanced living, pescatarian, plant powered, and gluten-free meals, you will have to pay $11.99 per serving. The most expensive options are the Paleo and keto programs, where one serving costs $12.99. The cost of a family dinner is always the same, regardless of whether you opt for the omnivore program or the carnivore program. It amounts to $10.99 per serving. Shipping is not free, unfortunately. Green Chef charges $6.99 for shipping and handling your orders, no matter where in the United States you live. Green Chef dinner kits can reach your home almost anywhere in the continental United States. There are only several areas in Louisiana that are not covered. Like with many meal kit services, Alaska and Hawaii shipments are unfortunately not available. Since you can select your delivery day, you should know that it is possible to change it too. You can also change your delivery address, but you have to do so before the weekly cut-off. For example, if you schedule a delivery for Thursday, you need to change your settings before Wednesday midnight the week before. To make sure Green Chef meets all your standards and expectations, it is important to know its biggest advantages and disadvantages. With a short overview of its pros and cons, you can easily decide if Green Chef is the right meal kit service for you. If you subscribe to Green Chef, you can easily prepare culinary masterpieces using only the ingredients and recipes found in your meal kit box. You may not be a pro chef just yet, but with Green Chef, you can easily make restaurant-grade meals. You don’t have to take our word for it – check out the images below to get a better idea of the types of dishes you can enjoy with Green Chef. To conclude this Green Chef review, with this meal kit delivery service, wholesome, organic food can be delivered to your doorstep every week, whenever it suits you the most. 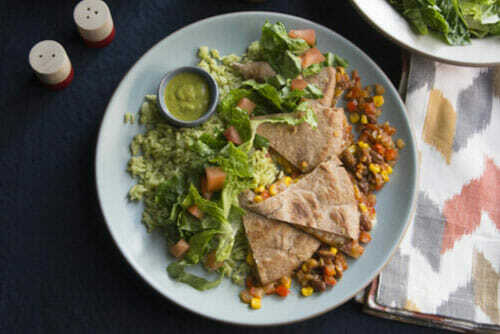 Whether you are a vegetarian, vegan or enthusiastic meat lover, Green Chef has a meal plan for you. You can switch plans, try different diets, and stick to the one you find most suitable for your lifestyle. Chef-crafted recipes, amazing variety, and the finest organic ingredients combined with unparalleled flexibility make Green Chef a meal kit service you do not want to miss. How to cancel Green Chef? You can cancel your subscription directly from your Green Chef account. Go to the Account Info section and click the Cancel Subscription button. Follow the prompts and wait for a confirmation email. Visit this link for more detailed instructions. How much is Green Chef per week? With the 2-person plan, you get 3 meals per week. You can choose from 7 different options and prices range from $62.94 to $89.94 a week. With the Family Plan, 2 meals per week for 4 persons cost $95.92 for omnivore meals and 103.92 for carnivore meals. Where is Green Chef located? Green Chef is based in Colorado. How much is Green Chef per month? With the 2-person plan, your monthly costs will be anywhere from $250 to $360 (depending on the option you choose). With the Family Plan, you pay about $385 for omnivore meals and $415 for carnivore meals per month. Green Chef uses many ingredients that are certified organic. In case certified organic ingredients are not available, the company focuses on sourcing conventional options of the highest quality. Our ratings are the result of an objective and independent evaluation of Green Chef, generating the final rating that reflects the overall quality of the company. Ratings may change as the service changes. Green Chef customer rating based on 11 customer reviews. First of all, GreenChef does not give you enough options to pick your own meals. Secondly, the recipe's were not very good. I canceled my subscription. 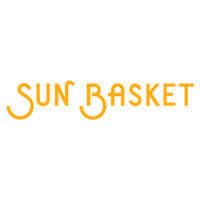 SUNBASKET is much better and gives you more options. I was really excited for this meal delivery service; however, after two shipments I have to cancel. The first shipment was on time and packaged per individual meal as expected. The second shipment was almost two days late and when I opened the box, the meat was nearly room temperature. In addition, all other ingredients were just tossed in the box. Spices, vegetables, and meat was not separated. I had to throw it away since some of the packaging was leaking and I had no way of knowing if it was the tuna, chicken or any of the sauces. Then to top it all off, when I called Customer Service, they could only refund me for the late shipment and couldn't cancel my next shipment or refund me because a manager wasn't on duty. They also could not tell me when a manager would be back to authorize my request. At this point, I still don't know if my membership moving forward is actually cancelled or not. I'm still waiting for a phone call as promised. I would have wanted to give them another chance, but even the flavor of the meals I did try wasn't very impressive. All in all, this convenient service has proved not so convenient. I guess I'll be headed back to the grocery store tonight. Did they ever respond back? For me, going keto was really hard and discovering Green Chef was a true blessing. I still miss all the carbs, but at least the meals I cook with GC taste like real food. This is the only meal delivery I’ve found that is both certified organic and certified gluten-free and that is good enough for me. I only wish I could order more kits per week. Easy, quick, organic, plenty of options – what’s not to like?! Sure, the prices are not low, but man, are the kits worth it! I mean, it’s not like you can get this kind of quality for $5 bucks. Don’t understand these people who complain about not being able to pick their own meals. You CAN pick your meals, you can order from any menu you like. If you like the Paleo meals, go Paleo, if you like the Omnivore meals, choose that program, you are not stuck with the 2 or 3 meals on the individual menus. GC rules! The meals are definitely the best i’ve cooked, no question about it, but the prices… i wish they were at least a bit lower. I'm a working mom and don't always have time to cook for my family, but since I've started ordering from GC, everything's much, much easier. My kids enjoy new food and like most of the dishes. I'm also happy that I know everything I prepare is organic and gluten free. We found 1 verified Green Chef discount for April, 2019. 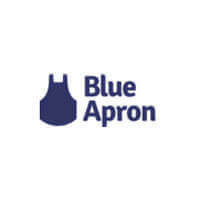 $50 Off Get $50 Off your first order at Green Chef! Sign up and we’ll let you know about future Green Chef promo codes. If you like Green Chef but aren’t sure whether they are truly the ideal choice for you, you may want to take a look at our comparisons below to discover if one of their competitors is more suitable for you.